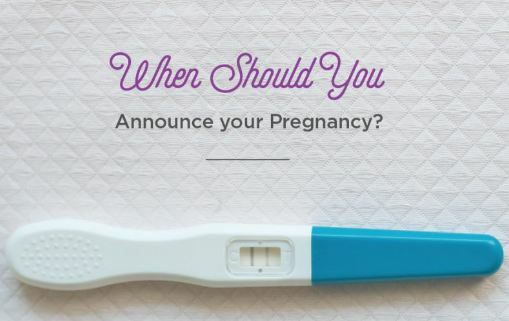 Homepage / Maternity / When is it Safe to Announce a Pregnancy? When is it Safe to Announce a Pregnancy – With the positive test, the first impulse is to warn everyone that the baby will be arriving. Its hard to keep so much happiness! But is there an ideal time to announce a pregnancy? The truth is that it is up to each woman to decide when to count since the pregnant woman will have to deal not only with her expectations but also with people who are around her. Do I wait 3 months? Pregnancy: Telling or Not Telling Everyone? Your husband was expecting the positive result as much as you, so its only right that he is one of the first to know. To make the moment even more special, surprise! Spread notes around the house or wrap the result in the form of a gift. Have you ever thought about it? In the case of grandparents, and brothers, it is worth thinking, how will they deal with the news? In some cases, they become so euphoric and anxious that they end up pressuring the pregnant woman beyond what she would like. But if not for you, why wait? The first few months of pregnancy are delicate and the risk of miscarriage is greater. Therefore, many women prefer to wait before telling the novelty. In some cases, the result of the 1st morphological ultrasound, which happens between the 11th and the 14th week, ends up being the deadline to keep the secret. This is because, through the examination, the doctor makes a more detailed evaluation about the development of the fetus and analyzes if there is any imminent risk in the pregnancy. The idea is to count personally, preventing people from knowing by gossip. In the case of the boss, the conversation can be scheduled shortly after the first consultation with the obstetrician. Thus, you will answer some questions, such as delivery date, more accurately. When we get pregnant, we are in such a state of excitement (and disbelief) that we want to scream at the seven winds that we are going to be mothers! I remember well on July 29, 2013, a Monday afternoon. After leaving the routine appointment and having discovered that I was pregnant (six weeks and three days), I wanted to call David to tell him, but I had to restrain myself to give him a surprise. I wanted to call my mother, my father, my brother, my best friends. I wanted to tell the ladies of Zaras box, where I went to buy the first babygrows. I walked in the clouds. Thats what I remember from that day. I told David at home (I did video without him realizing it, but hes boring and does not let me show why his reaction was “are you kidding me ? !” with a huge, drooping chin, “Im going to try to convince him.”) My brother was also in the kitchen and was the second person to know. Then we decided to go to Santarém to tell my mother (on the 29th it was an important and sad day, so I could not have been better) and then we went to Almeirim to tell my father and my grandfather. Then we told the sister-in-law personally, and we knew that day that she was pregnant too! It was crazy! We could not stand it and we had to tell the mother-in-law, too, who knew my cell phone and ran to Lisbon. Two grand? Wow. (They were born one day apart!). Two days later, I invited Raquel, my friend, to dinner and I told her. Everything recorded by the phone. He cried a lot. It was lovely to see. I think we had about 20 people before three months.The nearest ones. I went there to bite my tongue to tell more people who are dear to me, but I told those who, if the pregnancy had not avenged – I know it is more common than we imagine and I do not want to think about the pain – I would want to have by my side, to support me. I told those with whom I share the good things and the bad things of my life. But I also know that there are many mothers who can wait for the 12 weeks to tell everyone and that they can keep a secret with their future parents. Wow, I do not know how they do it, really! I poured joy and excitement through every pore – through my stomach was popping out of my mouth – and I think there was even a stamp on his forehead. Are you more expansive, like me, or could you wait to tell you later? Previous post When Should I Take a Pregnancy Test Calculator?